Hadi Dowlatabadi is Canada research chair and professor in Applied Mathematics and Global Change at the University of British Columbia. Richard Lindzen is a professor of Meteorology at the Massachusetts Institute of Technology. A clean environment is important to us all. We have an obligation to maintain our resources and sustain our environment for future generations. Sustaining our environment has led us down the road to environmentalism. Then a strange thing happened. Environmentalism came to a fork in the road. While the rhetoric took one route, the agenda took another. Explore this topic and discover how Agenda 21 will affect you. I am sure you will find a lot on this subject (check out HAARP technology and Chemtrails) on the Internet. I hope this clip will inspire to further investigations. The BP oil disaster in the Gulf of Mexico has led to devastation along Louisiana’s coast and in its fishing and tourism industries. But was it deliberate? Jesse Ventura leads his team into the bayou where they investigate claims of a plot to depopulate Louisiana and turn it into America’s refinery. At the core: the government’s alleged secret, multi-billion dollar depopulation program that began in the aftermath of Hurricane Katrina and was kicked into Phase Two with the oil rig blast. 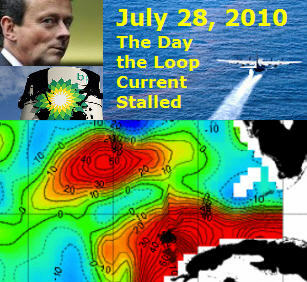 Yowusa.com – BP Oil Spill Stalls Gulf Loop CurrentOceanographic satellite data now shows that the Loop Current in the Gulf of Mexico has stalled as a consequence of the BP oil spill disaster. This according to Dr. Gianluigi Zangari, an Italian theoretical physicist, and major complex and chaotic systems analyst at the Frascati National Laboratories in Italy. JOURNALISM, WHAT CAN I SAY!!! I just have to add a quote from the “news” of the Norwegian weather forecast site called “yr.no”. The article is about the cold that strikes Europe as well as the US. “It reminds me of “The day after tomorrow” – the movie where the United States froze to ice in a flash because the warm Gulf Stream stopped. Fortunately, only on film that such things happen.” Check out the article!